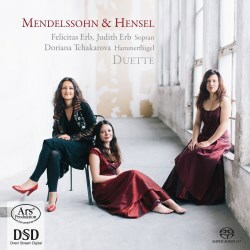 This is not the first time that the vocal duets of Felix Mendelssohn have appeared on disc. Hyperion released an acclaimed series of five discs which contained all of his songs and duets (CDA66906, CDA67137, CDA67388, CDA67739, CDA67753 - review) and whilst the singers changed as the series progressed, the pianist, Eugene Asti, remained a constant. This is an excellent series that has provided much enjoyment to me. It also includes some of Fanny’s lieder, including a handful of duets expertly performed by Sophie Daneman and Sarah Connolly. When it comes to the Mendelssohn duets they are spread between different voice combinations. For example Volume one again offers the listener Sophie Daneman although this time with the baritone Nathan Berg, a blend that works well. It is good therefore, to have a single disc containing the complete duets of both Felix and Fanny — no more disc-hopping to find other works. It is especially good that the works of both composers can be compared and contrasted relatively easily. In doing this at least one thing becomes clear: Fanny was a consummate composer. Her music is not here simply to fill a disc. Indeed she composed more duets than her brother and her music is every bit as good as her more well-known sibling. One only has to listen to a handful of her duets to appreciate this. For example, just listen to her first offering, Der Winterwind entflieht, which is sung without piano accompaniment, and you become instantly aware of her stature as a composer of lieder. This is further strengthened by works such as Wiederkehrt ein lichter Maie and especially Abschiedslied der Zugvögel. Indeed this is a disc that proves her worth in the great German lieder tradition. This music is full of charm and drama and they sit well with those of Felix with his own once again proving that he was an important composer of songs. The performance of Judith and Felicitas Erb is excellent; the blend of the two soprano voices works exceptionally well together, despite the greater depth offered by Nathan Berg. I don’t miss the male element, with the Erbs colouring their voices to bring out the most of the texts. They are expertly accompanied by Doriana Tchakarova on a Pleyel fortepiano, proving she is a real partner in this recording. This disc reminds me in many ways of my favourite disc of songs of both Felix and Fanny, The Art of Mendelssohnian Song recorded by the soprano Francine van der Heijden and Ursula Dütschler, again playing a fortepiano, for Claves (CD 50-9901). It looks bound to take its place next to the Claves disc as my go-to disc for their duets. The notes are excellent. The only drawback is the lack of translations of the song texts although these are easily found elsewhere. The recorded sound is sympathetic to the voice whilst bringing out the best of the piano. Whilst some will shun the idea of a fortepiano, one need not worry as the Pleyelflügel, 1849, has a relatively modern sound for an instrument from the mid-nineteenth century. This is a wonderful disc, one which should be snapped up by all lovers of nineteenth century song.